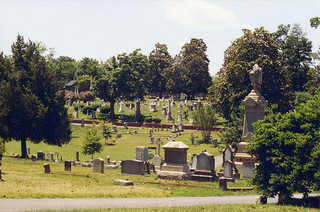 Oakwood Cemetery in Raleigh was established by the Raleigh Cemetery Association in 1869, making it Raleigh's oldest private, nonprofit cemetery. The cemetery is located on gently rolling hills adjacent to downtown Raleigh, its numerous monuments and markers set off by the natural topography, featuring oaks, cedars, and flowering trees and a meandering stream. Seven North Carolina governors, five United States senators, eight chief justices of the North Carolina Supreme Court, and Raleigh's first mayor are buried in Oakwood. A Jewish cemetery and a Confederate Cemetery, containing the graves of 2,800 Confederate dead, also lie within Oakwood Cemetery's boundaries. The Confederate Cemetery was established directly after the close of the Civil War, in 1866. A group of Raleigh women conceived the idea of establishing a permanent burial place for Confederate soldiers who at that time were buried on the location of the present Federal Cemetery on Rock Quarry Road. Using land donated by Henry Mordecai, the Wake County Ladies' Memorial Association began the preparation of a graveyard on the new site. In 1867 a federal agent was sent to Raleigh to find a cemetery site for Union soldiers. He chose the Rock Quarry Road location and gave local citizens three days to move their Confederate dead from that cemetery. More than 500 bodies were hurriedly exhumed and relocated on the Mordecai property. The graves within the Confederate Cemetery were originally marked with small granite posts bearing only a number. In 1989 the U.S. government furnished larger monuments identical to those used in federal cemeteries throughout the country. A House of Memory commemorating American veterans of all wars stands adjacent to the Confederate graves. The Confederate Cemetery is improved and cared for by the Sons of Confederate Veterans. "Oakwood cemetary, Raleigh, NC." Image courtesy of Flickr user Oliver Hammon, uploaded April 12, 2005. Available from http://www.flickr.com/photos/olivander/9617373/ (accessed May 18, 2012). Unfortunately, NCpedia does not have any additional information about Oakwood Cemetery burials. You may want to visit the cemetery’s website – they include a search feature to search burials: http://historicoakwoodcemetery.org/search-burial-records.asp. You may also wish to contact the cemetery to see if they have additional information.